Yoga Classes Jacksonville: Students Love Our Instructors! Looking for yoga classes in the Jacksonville area? You’re in luck. The Yoga Den has been Jacksonville’s choice for yoga classes, workshops, and teacher training courses for many years. As you’ll see by browsing through the many blogs on this website, we think that yoga is a great way to look and feel your best, allowing you to build muscles while also strengthening your mind and spirit. We can tell you how great our yoga classes are until we’re blue in the face (first rule of yoga, always remember to BREATHE! ), but we realize that you’re probably more interested in what our yoga students have to say. Keep reading as we dissect a recent Google review from one of our newer yoga students. We’ll touch on each aspect of the review, pointing out how we strive to provide yoga classes that are accommodating and refreshing for every type of person, whether it’s your first yoga class or your 500th! Thanks for the great review, Marge! We realize you have many options for yoga classes in Florida, so we’re so glad you chose The Yoga Den. Let’s take a look at some of the specific points you brought up in your review, and how they may help others to realize what’s so special about our yoga studio. 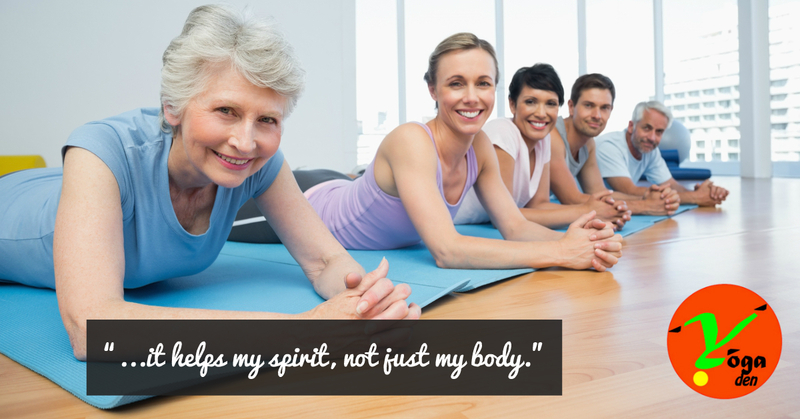 This is one of the most important parts of yoga classes at The Yoga Den: we welcome everyone. We realize that some people are very hesitant to try yoga because they think only a certain “type” of person works out this way. This is untrue. Yoga is a healthy practice for all shapes and sizes of people, and we invite everyone to give it a try. Again, we realize that not everyone is in the same place with their yoga practice. We won’t force you to touch your toes if the knees are all you can manage! The important part is that you breathe, calm your mind, and listen to your body. All of the instructors at The Yoga Den have gone through our extensive teacher training classes. Speaking of which, if you’ve always wanted to become a yoga teacher, our workshops are a great place to start! This just makes us smile. When our students feel mentally, emotionally, and physically refreshed after attending our yoga classes, we know we’re doing something right. Give The Yoga Den a try! Contact us to learn more about our current introductory special.